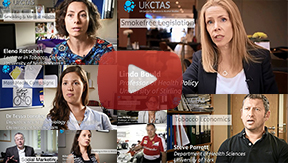 Here we have a selection of films that express the key themes relating to Tobacco reaearch. We are hoping to get more videos in coming months, including updates on Alcohol and Electronic Cigarette research. Smoking in film and media. We are in the process of making new films that show our research in a clear and consise fashion. To get upto date information about job opportunities and press releases from the centre. Follow us on Twitter to get daily updates from the UKCTAS and our researchers.